The Nightshade Fungalmancer Mouse can be found in Zokor. It is known to drop Cavern Fungus and Nightshade. These fungalmancers have picked up a thing or two from the scholars practicing their magics throughout the Labyrinth. Usually hidden from sight beneath their leaves, they absorb the magical energies cast out from other mice and harness them within their roots. They wait for unsuspecting intruders upon which to test their new powers. The Nightshade Fungalmancer Mouse prefers Glowing Gruyere, but can be attracted with Standard Cheeses. Forgotten and Arcane weapons are very effective against the Nightshade Fungalmancer Mouse. The Nightshade Fungalmancer Mouse can be found in the Overgrown Farmhouse. Nightshade Farming Charm - Causes the Nightshade Fungalmancer Mouse to drop an additional Nightshade. The Nightshade Fungalmancer Mouse drops the Fungal Egg during the annual Spring Egg Hunt. 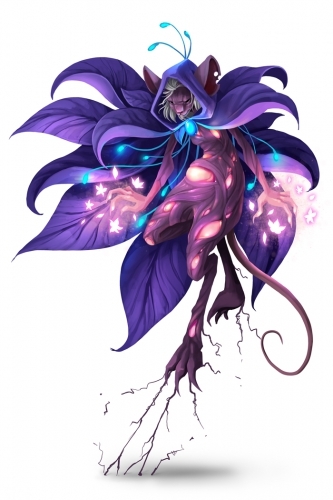 9 September 2015: The Nightshade Fungalmancer Mouse was introduced as part of the Hollow Heights release.